I love getting to know fellow bloggers/readers through surveys like this one! 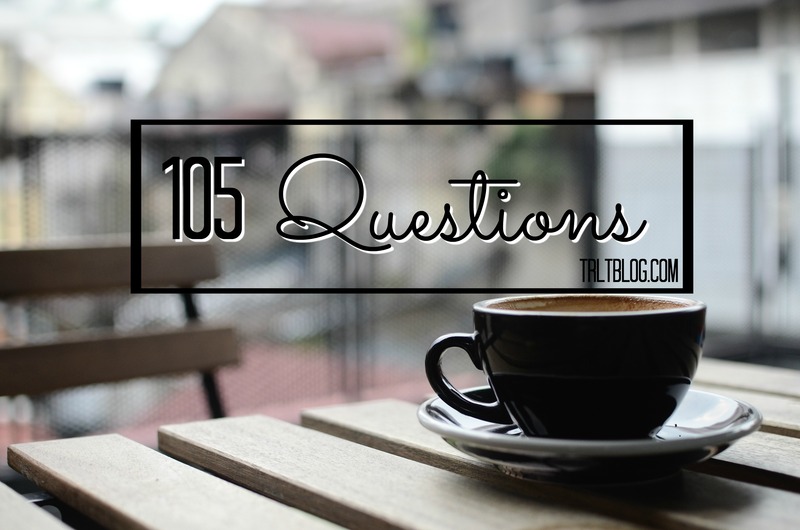 So, without further ado, here is 105 questions to help you get to know me! Play along in the comments! Definitely my mom and my best friends. Currently listening to a random spotify playlist to find some new music. The song playing is No One’s Gonna Love You by Band of Horses. Do you have a crush on anybody? Ed Sheeran & Nat Wolff always. ^^ But I also love Scott Michael Foster, Keegan Allen, and I have the biggest crush on the character of Leonard from the Big Bang Theory! That time I bought myself food. If you could choose one color to wear for a whole year, what color would you choose? Maybe a cranberry or olive! No, but that will hopefully change. What was the last film you watched? Did you like it? I just watched Beauty and the Beast this morning and obviously I liked it! I’ve always loved that movie! No, but I need to change that. Not like a lot a lot. When was the last time you had a pint of beer? Is there a certain food you often crave for no reason? I always crave asparagus, french fries, and sometimes I’ll crave pineapple. Do you shave your pits? What’s the last thing you’ve done that was crazy? Spend money on text books. I live a crazy crazy life! Nope! And I’m knocking on wood, haha! Any and all ways! I love eggs! I would say sunny side up is my absolute favorite, though! What was your last argument about and who with? I hit my brother because he was making fun of me because I had all of my stuff piled on top of me to move back to my apartment in the car and he wouldn’t let me put anything on his side of the car. Such a dumb argument but we got over it fast! Are you satisfied with the way your life is right now? It could always be better but I’m so grateful for everything I have right now. I try too! Especially because I’m petrified of being dehydrated. When was the last time you ate at Burger King? I think the beach, but I live in Boston so there aren’t too many mountains around me. I feel like if they were I would like the mountains more! How do you usually feel when you wake up on a morning? Exhausted. Always. Even if I slept I don’t feel well-rested at all. When was the last time you wore high heeled shoes? Ever had a crush on a teacher? Can you wire a plug? I don’t even know what this means. No, unless they are fuzzy socks! But that’s rare! What is currently bugging you? The headache I’ve had all day. Where were you when you got your first period? Oh god. It happened on the day of my 13th birthday pool party and I didn’t even realize it until a few days later when my mom taught me how to do laundry for the first time! I think I cried for hours. I also think my grandmother gave me money haha! Have you met more than ten celebrities? No :/ For a celeb obsessed person, this is really depressing. Never!! I need coverage at all times. I hate feeling a breeze on my body when I’m trying to sleep! What was the best music gig you’ve ever attended? Ed Sheeran and The Jonas Brothers! 19. Have you ever had sexual feelings for anyone you follow? Ed Sheeran. I see a trend. Do you think Benedict Cumberbatch is hot? I’ve never felt the need to smoke anything. So I guess Alcohol but I don’t really like that either. Eating. I can’t get enough of my veggies. What do you plan on doing with your life a decade from now? Working at a job I love, married, and kids. And dogs. Lots of dogs. Would you rather go back in time or remain where you are in terms of the time of your life? What do you crave for for desserts? Cookies are really the only desserts I crave. I don’t really have any style icons if I’m being honest. I like all different clothing styles. Jane The Virgin, Dance Moms, Once Upon a Time, New Girl, FRIENDS, HIMYM, The Office, Parks and Rec, One Tree Hill, The Vampire Diaries, Modern Family, HGTV Shows. I like a lot! Texting. I hate talking on the phone. Are you a frequent user of Facebook? Do you watch animated shows still? No, unless they’re old holiday specials! I hate toothpaste getting on anything but my teeth. It grosses me out. I’m also petrified of squirrels. Big mac or big whopper? Do you like to play board games? Would you eat a live spider for one million dollars? Would you forgive someone for cheating? Yes. Maybe not aliens like ET but definitely other forms of life. The universe is too big for it not to have anyone else out there. Are you a grumpy person? I can be. Especially if i’m tired. Not really. It depends on my mood. I like a few bites but then I get sick of it quick. What’s the weirdest flavor of ice cream you’ve tried? I stick to good old cake batter if I even eat ice cream but I’m really not a fan of ice cream. Do you remember lyrics easily? I’m allergic to amoxicillin. And I have the worst season allergies ever. Like sick for weeks because of grass and pollen. I can’t even step foot outside in the spring. Yes, if I don’t have anywhere to be. If I can stay in and relax. I like pie crust but not really pie. Would you like children in the future? The only cartoon I watch is Bob’s Burgers and that’s only when I’m in the mood. It was different every year but costumes I remember are Pumpkin my first Halloween, Jane from Tarzan, A hippie angel, a hippie devil, one of Josie and the Pussycat Dolls or whatever that was, I think I might have been Cinderella one year too. No I love musicals! Theater kid at heart! I will ALWAYS choose Target. I love both! But I like green a little better! Yes!! I can’t wait to plan a wedding one day. Just because I want to plan a wedding so bad. Of course. I would hope everyone would do this. What is one thing you wish had zero calories?